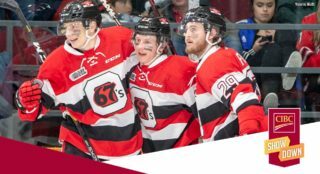 Jacob Ingham and Cole Carter teamed up in a shootout to deny the Ottawa 67’s their 40th win, taking a 2-1 victory on home ice to keep a firm grip on fifth place in the Eastern Conference. 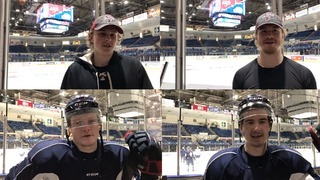 Ingham stopped 30 of the 31 shots he faced in regulation before turning away Marco Rossi, Tye Felhaber and Sasha Chmelevski in the shootout while Carter scored the game winner past Cedrick Andree. Lucas Chiodo (24) scored the lone goal for Ottawa, extending his current point streak to a career-high nine games in the process. Mississauga defenceman Liam Ham (7) tied things up 5:43 into the third frame. Andree stopped 37 of the 38 shots he faced to help the 67’s earn a point. 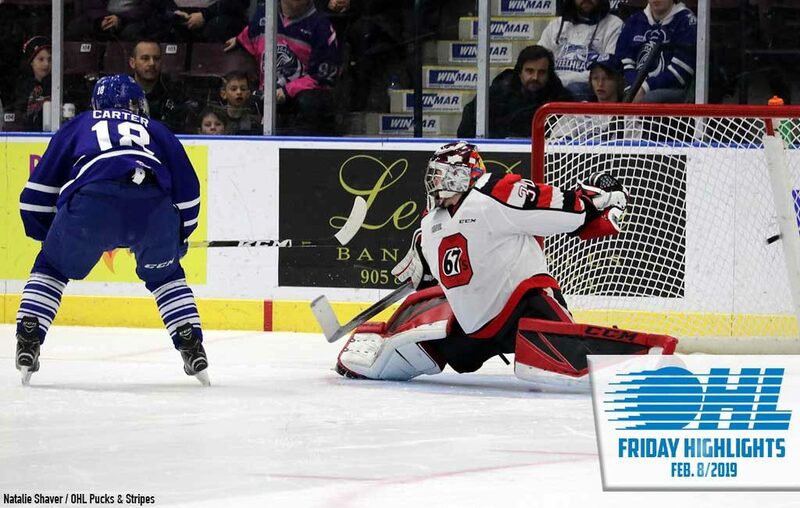 Mississauga improves to 25-21-5-1 while Ottawa’s nine-game winning streak is snapped. They continue to lead the Eastern Conference with a 39-9-3-2 record. Montreal Canadiens prospect Allan McShane (25) one-timed an OT winner past a sprawling Cole Ceci as the Oshawa Generals skated to a 4-3 win in Erie. Anthony Salinitri (39) opened the scoring, netting the first Generals goal at Erie Insurance Arena since November 2015 before Serron Noel (28) and Brett Neumann (34) also tallied for the Gennies. McShane earned first star honours with the game winner along with two assists. The aforementioned Ceci made 31 saves against his former club to help the Otters earn a point in the overtime loss. Petr Cajka (18), Gera Poddubnyi (25) and Daniel D’Amato (4) provided Otters goals as they were outshot 35-22. 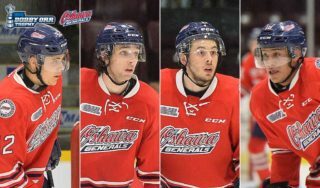 The Generals played their third consecutive game beyond regulation, winning for the fourth time in their past five outings to improve to 32-18-3-0. Erie sits three points back of eighth place Windsor in the Western Conference, falling to 20-28-2-1. Liam Kirk (19) knotted things up at three with 2:35 left in the third period before Brady Hinz and Adam Timleck scored shootout markers to guide the Peterborough Petes past the Kingston Frontenacs 4-3 on the road. 2019 NHL Draft prospect Nick Robertson (19, 20) scored twice for the Petes while defenceman Ryan Merkley picked up two helpers as the Petes outshot the Frontenacs 43-24 and went 2-for-3 on the power play. Ryan Cranford (14), Dawson Baker (8) and Adrien Beraldo (6) scored for Kingston as the Frontenacs surpassed the two-goal mark for the first time since Jan. 11th. Marshall Frappier earned second star honours with a 40-save performance in the Kingston crease. The Petes get back in the win column, improving to 25-24-1-2 for a sixth place tie in the Eastern Conference. Kingston drops a ninth straight decision, falling to 12-38-1-1. 2019 NHL Draft prospect Blake Murray (23, 24, 25) netted his second hat-trick of the season as the Sudbury Wolves won their seventh straight game, piling on the visiting Flint Firebirds 9-2. The Wolves jumped out to a 4-0 lead, giving rookie netminder Jonathan Lemaire an early cushion as he went on to win in his OHL debut. 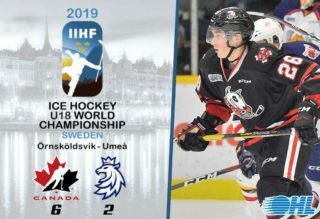 Nolan Hutcheson (17, 18) scored a pair of goals and tacked on three assists for a five-point night while Quinton Byfield (19) netted a shorthanded goal and added three assists of his own. Owen Robinson (7), Liam Ross (7) and Darian Pilon (13) added singles for the Wolves as they outshot the Firebirds 41-27. Jacob Winterton (10) and Ethan Keppen (23) scored Flint goals, with the latter scoring in a fourth straight game. 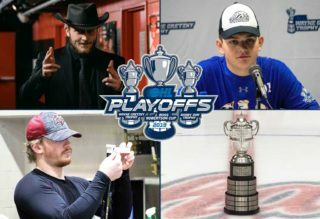 Sudbury climbs to 32-16-2-1, just four points back of first place Niagara in the Central Division. Flint suffers a sixth straight loss, falling to 9-41-4-0. Cameron Lamour stopped 36 of 38 including a Nick Suzuki penalty shot to backstop the Sarnia Sting past the Guelph Storm 6-2 on the road. The Sting took the front end of the home-and-home set as Jamieson Rees (10) and Nick Grima (3) each had a goal and an assist. Justin McCombs (3), Hugo Leufvenius (31), Brayden Guy (17) and Sean Josling (14) also scored for the Sting while Jacob Perreault, Anthony Tabak and Franco Sproviero all had a pair of assists. Guelph outshot Sarnia 39-25 as Nate Schnarr (26) and Alexey Toropchenko (14) scored in the loss. Sarnia returns to .500 on the season with a 23-23-5-2 record, good for sixth in the Western Conference. 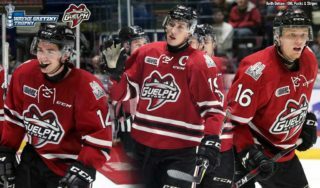 Guelph sits six points back of third place Saginaw with a 27-14-6-4 record. Arizona Coyotes prospect Jan Jenik (5) scored the game winner with 5:33 left in the third period before Arthur Kaliyev (41) hit the empty net to complete a hat-trick in a 6-4 Hamilton Bulldogs road win in Kitchener. Kaliyev was in on five of Hamilton’s six goals, finishing with three goals and two assists, extending his point streak to six games. Logan Morrison (8) and Matthew Strome (25) also scored for Hamilton as the Bulldogs went 3-for-6 on the power play. Greg Meireles (25, 26) potted a pair of goals and added an assist in the loss while Jonathan Yantsis (37) and Rickard Hugg (25) also tallied. Goaltenders Zachary Roy and Lucas Pfeil each made 28 saves on the night as Hamilton snuck ahead of North Bay, improving to 24-24-3-2 for seventh in the Eastern Conference. Kitchener drops to seventh in the Western Conference with a 24-24-3-0 record. The London Knights overpowered the Owen Sound Attack, taking a 6-3 win on home ice as 2019 NHL Draft prospect Connor McMichael (32) earned first star honours with a goal and an assist. Blueliner Adam Boqvist (13) had a goal and two helpers to his credit while Nathan Dunkley (21), Matvey Guskov (9), Alec Regula (7) and the newly returned Alex Formenton (8) also scored for London. Maksim Sushko (14), Carter Robertson (3) and Cade Robinson (6) provided Owen Sound goals as the Attack was outshot 40-28. The Knights earn their seventh straight win to improve to 37-7-5-1 atop the Western Conference. The Attack see back-to-back wins go by the wayside as they fall to 25-23-2-2.